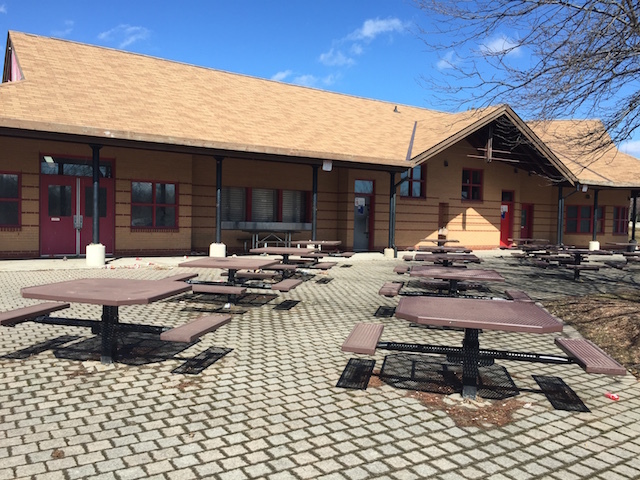 I first heard about Milliken Park in Ward 41 not long after I moved to Toronto, but it wasn’t really for the best reason. The park was in the news because the City had moved to ban kite flying. The issue was that the type of kite flying that was happening, something called “kite fighting,” was leaving bits of string coated in glass around the park that was hazardous to people, but also the animals in the park. So, they banned kite flying. The City reported on how to regulate kite flying in 2011. It seems to ban only kite fighting and the use of dangerous materials in the string of kites (like those coated in glass), but if you go to the park there is still a sign that bans kite flying. Hilariously, the sign uses the picture of a very innocuous child’s kite with little bows tied to its string. Sorry little Sally and Jimmy, but I’m going to have to slap you with a by-law infraction. 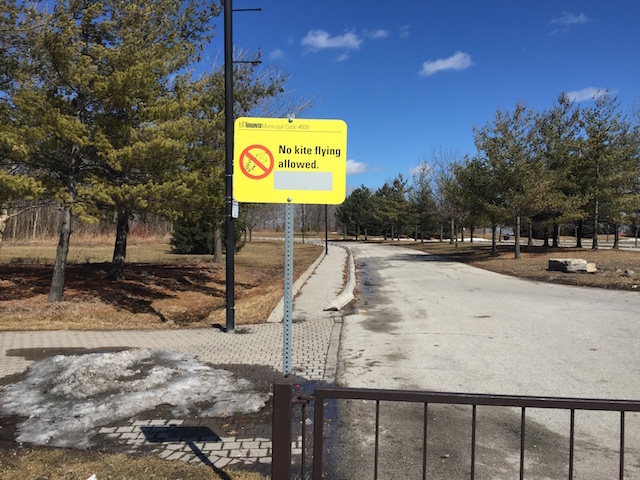 Walk around the park and more “No” signs appear. 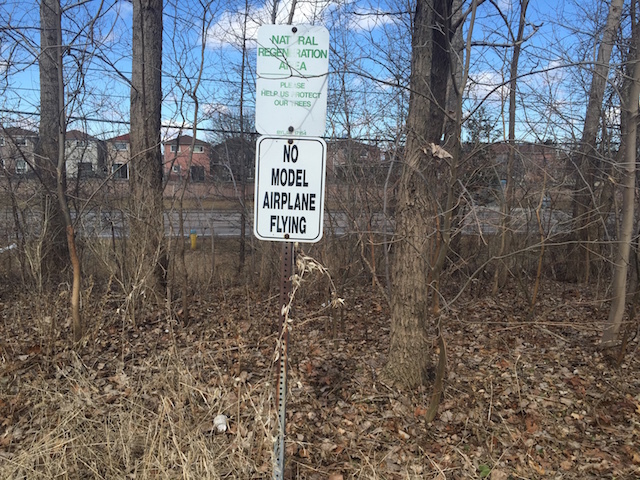 There was a No Model Airplane Flying sign that I found along the pathway that wraps itself around the park. I’m not exactly sure why. Were people flying their planes directly into the natural regeneration area? 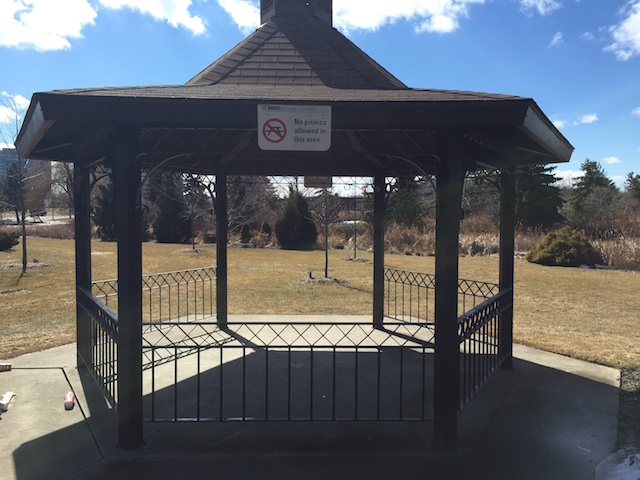 Then there was the No Picnics sign on a gazebo in a small garden area. Again, not sure why. Maybe this is a memorial garden area and is meant more for quiet reflection? Forget all the signs telling you what you can’t do in Milliken Park though, and what you find is a pretty lovely, large park with a natural area and trail surrounding a big open field with huge gazebos. There’s a good sized pond that was still frozen when I went. It would make an awesome outdoor skating rink–if you were allowed. There was also a dock right out onto the water that would be a great spot to sit and have a drink on a hot summer day–if you were allowed. A nearby cafe building was closed, but had a nice patio. After exploring Milliken, I crossed over into Markham which borders the park on the north side. I managed to penetrate the walls that were put up around a subdivision and walk down a street that was wide enough to land a commercial airliner on. Google Maps told me there was a park in the middle of this subdivision, so I wanted to check it out. When I got there, I found a big, sprawling green space and, surprise, a park sign at the entrance with a list of things with red lines through them. Don’t do this. Don’t do that. Not allowed. No. Nope. Don’t even think about it. Is there another way we can do this? I understand that we need to have rules and that certain things are not allowed in parks because they pose a danger to wildlife, the natural environment of the park, or simply because the park is not designed to accommodate them. But it would be nice to find another way to portray these things. Perhaps they can be designed in such a way that they don’t resemble the signs at airport security telling you what you can’t bring on the plane. A study related to national parks in the US found that positively worded signs worked better. And if you’re going to ban something, at least explain why so that people understand the context. 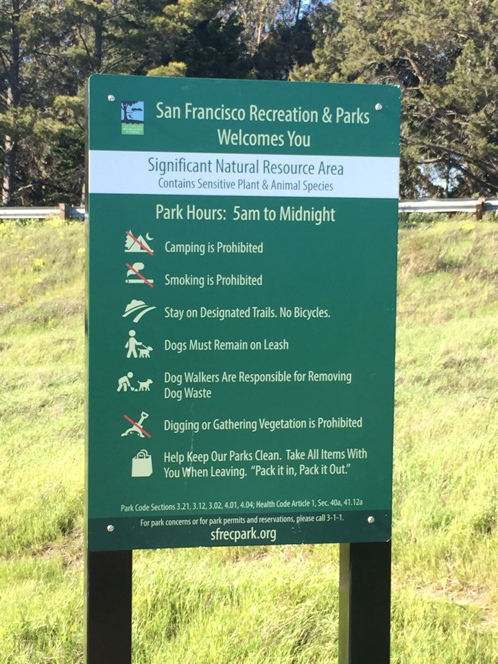 In San Francisco, for example, the park signs used examples of good behaviour for most things, showcasing what the appropriate way to use the park was. The sign still has red lines through certain activities, but the overall approach is more welcoming–it even welcomes you to the park. I like this positive approach. Nice article. Very perceptive. The Highland Creek Green Team and I are trying to help make some improvements. 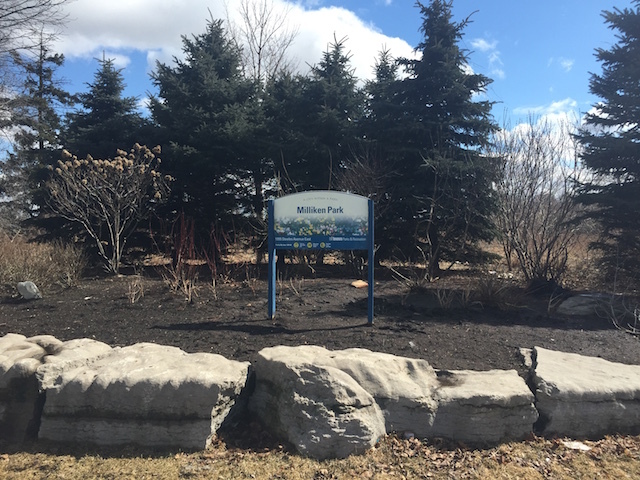 Check out this good sign for Milliken Park. This is great. Thanks for sharing, Cass. Thanks for sharing, Cass! Nice signs.